NOTICE: Activation key must be used on a valid Steam account. Requires internet connection. ABOUT THE GAME Batman Arkham City Game of the Year includes the following DLC: Catwoman Pack, Nightwing Bundle Pack, Robin Bundle Pack, Harley Quinn’s Revenge, Challenge Map Pack and Arkham City Skins Pack. Batman: Arkham City Game of the Year Edition packages new gameplay content, seven maps, three p… layable characters, and 12 skins beyond the original retail release: Maps: Wayne Manor, Main Hall, Freight Train, Black Mask, The Joker's Carnival, Iceberg Long, and Batcave Playable Characters: Catwoman, Robin and Nightwing Skins: 1970s Batsuit, Year One Batman, The Dark Knight Returns, Earth One Batman, Batman Beyond Batman, Animated Batman, Sinestro Corps Batman, Long Halloween Catwoman, Animated Catwoman, Animated Robin, Red Robin and Animated Nightwing Batman: Arkham City builds upon the intense, atmospheric foundation of Batman: Arkham Asylum, sending players flying through the expansive Arkham City - five times larger than the game world in Batman: Arkham Asylum - the new maximum security home for all of Gotham City's thugs, gangsters and insane criminal masterminds. Featuring an incredible Rogues Gallery of Gotham City's most dangerous criminals including Catwoman, The Joker, The Riddler, Two-Face, Harley Quinn, The Penguin, Mr. Freeze and many others, the game allows players to genuinely experience what it feels like to be The Dark Knight delivering justice on the streets of Gotham City. 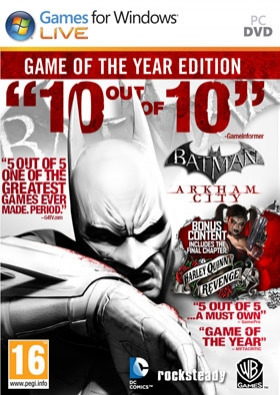 KEY FEATURES Batman Arkham City: Arkham City Skins Pack Contains seven bonus Batman skins: 1970s Batman Year One Batman The Dark Knight Returns Earth One Batman Beyond Animated Batman Sinestro Corps Batman The seven Batman skins can be used in storyline mode upon completion of main story and all challenge maps. Batman Arkham City: Challenge Map Pack Contains three all new challenge maps: The Joker’s Carnival Iceberg Lounge The Batcave These challenge maps are playable as Batman and any of the downloadable playable characters Catwoman, Nightwing and Robin. *Note: Catwoman, Nightwing and Robin each sold separately. Batman: Arkham City: Catwoman Pack Download the fully playable Catwoman character in a unique storyline. The Catwoman Bundle Pack comes with two bonus Catwoman skins: Long Halloween Catwoman and Animated Catwoman. Batman Arkham City: Nightwing Pack. Nightwing comes complete with his own unique gadgets and special moves, and is playable in all challenge maps in the game, as well as two additional challenge maps that are included with the pack: Wayne Manor and Main Hall. The pack also contains a bonus Animated Nightwing character skin. Batman: Arkham City: Robin Pack Download the fully playable Robin character. Robin comes complete with his own unique gadgets and special moves, and is playable in all challenge maps in the game, as well as two additional challenge maps that are included with the pack: Black Mask and Freight Train. The Freight Train Escape challenge map is a unique take on Arkham City, featuring brawler gameplay on a 2D plane. The pack also contains two bonus character skins: Red Robin and Animated Robin. Batman: Arkham City: Harley Quinn's Revenge As the dust settles in Gotham, Batman is lured back into Arkham City by its last remaining super-criminal; Harley Quinn. Now more dangerous than ever and leading a homicidal gang of her own, she is hell-bent on taking her revenge against the Dark Knight. Allows players back into the urban mega-prison to face down its final challenge. Playing as both Batman and Robin, gamers will utilize each of the heroes’ unique combat and detective skills to uncover Harley's vengeful plan and close the book on Arkham City forever. Key Features: Play as both Batman and Robin as the high-stakes story unfolds Face off against all new Gang’ enemy types Traverse the new environment using Robin’s unique navigational abilities Collect 10 Achievements Over 2 hours of unique content SYSTEM REQUIREMENTS Minimum OS: Windows XP, Vista, 7 Processor: Intel Core 2 Duo 2.4 GHz or AMD Athlon X2 4800+ Memory: 2GB RAM Hard Disk Space: 17 GB free hard drive space Video Card: ATI 3850HD 512 MB or NVIDIA GeForce 8800 GT 512MB DirectX®: 9.0c Other Requirements: Online play requires log-in to Games For Windows – LiveBATMAN: ARKHAM CITY software © 2011 Warner Bros. Entertainment Inc. Developed by Rocksteady Studios Ltd. All other trademarks and copyrights are the property of their respective owners. All rights reserved. DC LOGO, BATMAN and all characters, their distinctive likenesses, and related elements are trademarks of DC Comics © 2011. All Rights Reserved. WB GAMES LOGO, WB SHIELD: ™ & © Warner Bros. Entertainment Inc.